While the local organising committee for the match is not anticipating any trouble it says that it has to ensure the safety of spectators and the playing teams. General coordinator for the O-League match, Noel Wagapu, says that Solomon Islands has a good record so they do not want anything negative to affect this record. “We are wary about stone-throwing and pitch invasions which are sometimes experienced during local competitions. Such problems may result in Solomon Islands being banned from hosting O-League matches and this means that we will lose our privilege to witness this high level competition at home,” Wagapu says. The tough security measures are also aimed at ensuring the safety of high level officials from the government who will be attending as well as the President of the Oceania Football Confederation (OFC) and his General Secretary who will be guests at the match. The organising committee is also calling on the public to come out and show positive support to the clubs. “We will do our best to put things in order for the match but at the same time we ask the public to turn up and show good support to the clubs and not engage in any antisocial behaviour,” Wagapu says. The list of restrictions that has been put up includes a ban on the sale of betel nut and coconut around the Lawson Tama area and the organising committee is teaming up with the Honiara City Council (HCC) and the Royal Solomon Islands Police to enforce this with public notices already being put up by the HCC. Alcohol and weapons are also on the list of restricted items and security personnel will confiscate any such item from patrons if they try to bring them into Lawson Tama so the public is informed not bring anything like that with them. Another issue that concerns the organising committee is a pitch invasion and it is strongly asking the public not to run into the field during the match for any reason because this is against match regulations and represents a major security breach which brings the safety of the players and match officials into risk. At the same time the organising committee is calling on the public to ensure that they come prepared for the weather and must bring umbrellas in case it rains and lots of water for young children. Entrance fees for the match are as follows: Grandstand light-blue $60-00; Grandstand dark-blue $40-00; Complimentary Hill $30-00; Hillside (adults) $10-00 and Hillside (children) $5-00. 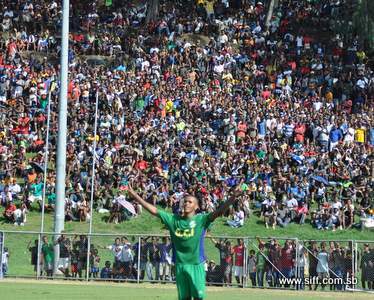 Tickets are now selling at the Solomon Islands Football Federation (SIFF) headquarters.